Heroes and Angels Corp. | Providing non medical support to children, and their families, who live with cancer. 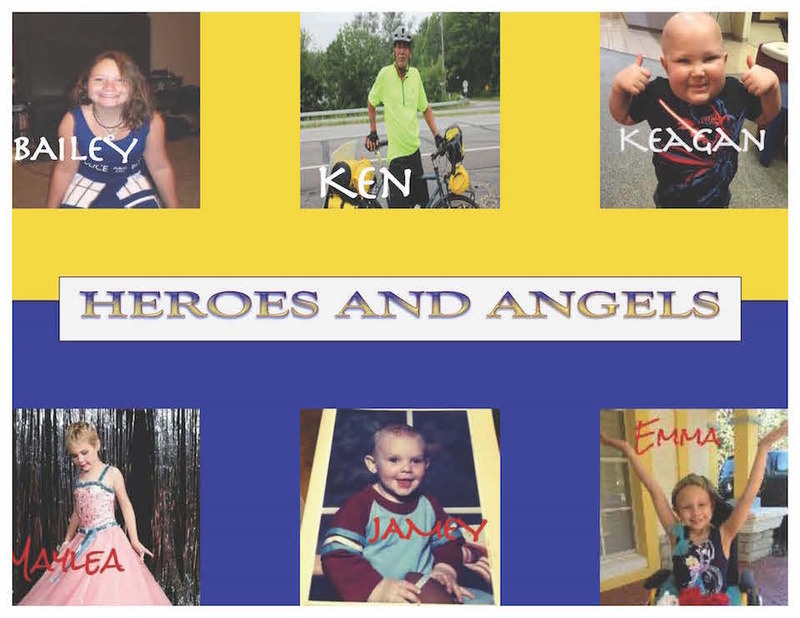 Heroes And Angels Corporation was founded to honor some very special heroes and angels we hold in our hearts. Our angels- Jamey, Emma, and Maylea, fly high little ones, you are always in our hearts. Our heroes- Ken, Bailey, and Keagan- they have shown us what true strength is. We pray for the day that, organizations like ours, will not need to help. But until there is a cure, we will continue to help those that we can. Heroes and Angels Corp. mission is to provide non-medical assistance, to families affected by childhood cancer, and to military families in need. Also to provide funding to organizations that research the causes and cures of childhood cancer. To ensure children are able to live a life without having to fight cancer. To meet the needs of the children and the families in need, we will raise funds by creating events for everyone to participate in and have an enjoyable time. Such as, an annual bicycle ride. Also, sweet tea stands will be one of our staple fundraisers. Good morning, team! I had the pleasure of meeting Ken this morning, and I just want to say thank you for everything you are doing! Safe travels! I sent an email to the email that is associated with your message. I also had the pleasure to meet Ken as he was reaching Monarch Pass [Colorado 11,933 feet!]. Exhausted but gave us a chance to chat. My only Child, Son  passed away from liver Cancer on a January 26th [Ken’s Birthday!] 13 years ago…. I still cannot talk about it too much without breaking down. My Dog and I for that reason have ourselves been on the road for 11 years. As my therapy is writing and photography, 9 million or so readers later we help and support each other. So great we bump into each other. Stay well. Ara and Spirit. Thank you Ara. We appreciate the kind words and offer our condolences. We will keep fighting as we are sure you will too. One day hopefully they will find a cure, but until then, we can just keep hoping and praying. Thanks again and godspeed…..
Met Ken at a camp site up Spanish Fork, Utah canyon. We were at a family reunion when Ken pulled in to stay the night. He had came from Green River, Utah that day which was about 140 miles he had rode his bike that day. Got to admire a person that will dedicate his life and time to help others. Enjoyed very much the time I had to talk to him. Hope you make it home safe. How do we contact you regarding assistance for families? You can use the contact us link that is on the website or you can email brandy@heroesandangelscorp dot (. )org or jack@heroesandangelscorp dot (.)org. Currently we are not set up to help families in need that are out of state. We hope to be able to do that soon though. Thanks. Just met Ken today traveling north of Crystal River, FL on US19. What a heart he has and what a blessing to know there are people out there that are so selfless! We will be praying for your safe travels, Ken, and may you be blessed along your journey as you touched my heart today. Your folks are two of my favorite people. They have passed that loving spirit along to you. Ken is staying in our home tonight here in Bristow, VA. I am going to help his effort financially. What an inspiration. I was also blessed to spend 12 hours with Hero Ken. Interesting, gracious, unassuming man with a big heart. Prayers for your mission. And whatever social media I can muster seeking contributions for your efforts. We saw Ken yesterday in the Black Hills of SD and wished we would have stopped. Well, today, we were lucky enough to spot him on our way to Denver just outside Edgemont SD, this time, we HAD to stop to donate to his cause. Safe travels and God bless you.